clinics, or any other equine related event qualifies!!! The trophy awarded for 2011 and 2012 was a collector's, limited edition, 2005 Breyer horse model in porcelain, of 'Breed Ambassador' Romantico H.H.F., in armor, mounted on a wooden base with an engraved brass plaque. 2001 - Guerrero (Sir Norman of Tiverton), gelding, owned by Joanne Fiola - Rhode Island. 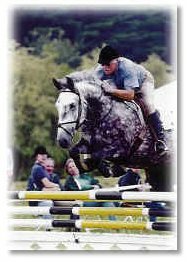 1998 - HHF Cariñoso Q, gelding, owned by W.H. and Gail Quattlebaum - Georgia. © Copyright 1999-2013 Spanish-Norman Horse Registry, Inc.
ALL RIGHTS RESERVED Please refer to our copyright page for more details.